Epifanio de los Santos Avenue (Tagalog: Abenida Epifanio de los Santos), commonly referred to by its acronym EDSA, is a limited-access circumferential highway around Manila, the capital of the Philippines. It is the main thoroughfare in Metro Manila passing through 6 of the capital region's 17 local government units, namely, from north to south, Caloocan, Quezon City, San Juan, Mandaluyong, Makati and Pasay. Map of highways on Metro Manila with EDSA highlighted in red. Named after academic Epifanio de los Santos, the road links the North Luzon Expressway at the Balintawak Interchange in the north to the South Luzon Expressway at the Magallanes Interchange in the south, as well as the major financial districts of Makati Central Business District, Ortigas Center and Araneta Center. It is the longest and the most congested highway in the metropolis, stretching some 23.8 kilometers (14.8 mi). The avenue is a component of Circumferential Road 4 (C-4) of Manila's arterial road network, National Route 1 (N1) of the Philippine highway network and Asian Highway 26 (AH26) of the Asian highway network. The locations around the avenue were marked with great economic and industrial growth, proven by the fact that all but 2 industrial centers in the Metropolis are directly accessible from the thoroughfare. The decent economic growth of the areas around the avenue adds a significant volume of traffic on the avenue, and in recent estimates, and an average of 2.34 million vehicles go through it every day. The avenue is a divided carriageway, often consisting of 12 lanes, 6 in either direction, with the elevated railroads Manila Metro Rail Transit System Line 3 and Manila Light Rail Transit System Line 1 often serving as its median. Although it is not an expressway, traffic rules and speed limits are strictly implemented to the vehicles that pass along it. It is operated by the Metro Manila Development Authority and is maintained and constantly being repaired by the Department of Public Works and Highways. The northern terminus of EDSA at the Bonifacio Monument in Caloocan. The intersection of EDSA and Taft Avenue. EDSA starts from the Bonifacio Monument (Monumento) Roundabout in Gracepark, Caloocan, adjacent to the Apolonio Samson Road, the western side of the C-4 Road. The roundabout is also the marker of the 1896 Revolution by Andres Bonifacio. The 1.7 kilometers of the road are in Caloocan. The Avenue will then enter Quezon City through the Balintawak District, after an intersection with the North Luzon Expressway in the Balintawak Interchange. EDSA crosses much of the northern part of Quezon City, passing through the Project 6 and Muñoz districts. It sharply curves southwards after crossing the North Avenue-West Avenue Intersection in the Triangle Business Park. On the north side of EDSA is the SM City North EDSA. In front of it is the TriNoma mall and the Eton Centris or Centris Walk. ABS-CBN Broadcasting Center and its transmitter can be easily seen from EDSA and continues southwards, slightly turning westwards slowly until it leaves the Triangle Park after crossing the East Avenue-Timog Avenue Intersection, where the GMA Network Center is located. It continues through the district of Cubao, entering the Araneta Center after crossing the Aurora Boulevard Tunnel. In Cubao, several malls, infrastructure and offices are located, most notably the Smart Araneta Coliseum, the biggest coliseum in Southeast Asia. The Avenue curves southwards and enters the Santolan and Socorro districts, where the twin military bases of Camp Rafael Crame and Camp Aguinaldo, are located. The Greenhills Shopping Center and the Eastwood City are also located nearby. EDSA then continues on its route and serves as the boundary of the cities of San Juan and Quezon City. The People Power Monument can be seen on the north side of EDSA in the White Plains Avenue junction. After the 11 kilometers of EDSA in Quezon City, the Avenue will eventually leave the city and enter the City of Mandaluyong. EDSA enters Mandaluyong after crossing the borders of the Ortigas Center. In the Ortigas Center, some notable buildings around the area are the Philippine Overseas Employment Administration building, Robinsons Galleria, SM Megamall, Forum Robinsons (Robinsons Pioneer), and the bronze EDSA Shrine, a memorial church to the 1986 Revolution. It then curves smoothly westwards after it crosses the Pioneer Street, and crosses the Pasig River via the Guadalupe Bridge and leaving the City of Mandaluyong. It enters the city of Makati after crossing the Pasig River, passing through the districts of Guadalupe, Comembo and Magallanes. In Guadalupe, EDSA provides access to the Rockwell Center, a major mixed-use business park in Makati. The highway also provides quick access to the city of Taguig and the Bonifacio Global City nearby. After crossing Buendia Avenue, the highway enters the Ayala Center, an important commercial district in the Philippines, where the Greenbelt and Glorietta shopping centers are located. The road then curves eastwards, continues on a straight route to the city of Pasay, and passing the South Luzon Expressway through Magallanes Interchange. EDSA enters Pasay shortly after crossing SLEX in Makati. In Pasay, the highway provides access to the Ninoy Aquino International Airport via a flyover. EDSA will pass to Pasay Rotonda and continues on a straight route until it crosses to Roxas Boulevard. After crossing Roxas Boulevard, it enters to Bay City reclamation area, where the large SM Mall of Asia is located. EDSA's terminus is at a rotunda in front of the Globe of the SM Mall of Asia. The lead agency that manages the flow of traffic along EDSA is the Metropolitan Manila Development Authority (MMDA), a government agency under the Office of the President of the Philippines and is advised by the Metro Manila Mayors League. One of the MMDA's traffic management schemes that is in effect on EDSA, among other major thoroughfares in the metropolis, is the Uniform Vehicular Volume Reduction Program. Many have observed that the cause of many traffic jams on EDSA are erring buses and jeepneys. Subsequently, buses have been the target of other traffic management programs, like the MMDA's Organized Bus Route Program. The MMDA is strictly implementing also the Motorcycle and Bus laning in EDSA, making it the second highway in the Philippines ever to have such traffic rule to be enforced, after Commonwealth Avenue. The average speed of vehicles in EDSA is 15 kilometers per hour (9.3 mph). From January 18, 2016, strict implementation on bus lanes started on the Shaw-Guadalupe segment, where plastic barriers are placed and prohibited entry of private vehicles and taxis on the bus lanes except when turning to EDSA's side streets. Despite the plastic barrier, many private vehicles still enter the lanes. Epifanio de los Santos y Cristóbal, the Filipino historian and jurist after whom EDSA was named. Construction of what was then called the North–South Circumferential Road began in the 1930s under President Manuel L. Quezon. The construction team was led by engineers Florencio Moreno and Osmundo Monsod. The road, starting from the North Diversion Road (today the North Luzon Expressway) and ending at the current Magallanes Interchange with the South Luzon Expressway, was finished in 1940 shortly before the outbreak of World War II and the subsequent Japanese Occupation. After the independence of the Philippines from the United States in 1946, the road was renamed Avenida 19 de Junio (June 19 Avenue), after the birth date of national hero José Rizal. In the 1950s, the avenue was renamed Highway 54, because of the common misconception on that time that the avenue is 54 km long. Rizalists wanted the avenue's name to remain 19 de Junio, while President Ramon Magsaysay wanted the avenue named after Rizal. Residents of Rizal Province (to which most parts of Metro Manila belonged until the 1970s) wanted the avenue to be named after a Rizaleño: the historian, jurist and scholar named Epifanio de los Santos y Cristóbal. The Philippine Historical Committee (now the National Historical Commission of the Philippines), the Philippine Historical Association, the Philippine Library Association, Association of University and College Professors, the Philippine China Cultural Association, and the Philippine National Historical Society, led by fellow Rizaleños Eulogio Rodríguez, Sr. and Juan Sumulong, supported the renaming of Highway 54 to Epifanio de los Santos Avenue. On April 7, 1959, De los Santos' birthday, Republic Act No. 2140 was passed, renaming the avenue to honor him. Rapid urbanization in the 1960s and 1970s, particularly after the annexation of several Rizal towns to the newly established National Capital Region, marked the growth of the industrial centers along the road, and several other roads connected to the avenue, such as Ayala Avenue and McKinley Road in Makati. During the rule of President Ferdinand Marcos, traffic jams along the avenue started to build up. Several interchanges were constructed to relieve congestion, including the Balintawak and Magallanes Interchanges at opposite ends of the avenue. Later, with the implementation of the Metro Manila Arterial Road System in 1965, in order to complete the Circumferential Road 4 system, EDSA was extended to Taft Avenue from the South Luzon Expressway (the extension was called F. Rein Avenue), and further to Roxas Boulevard (the extension was called P. Lovina Avenue). EDSA was also extended from its original Balintawak terminus to Apolonio Samson Road at the roundabout containing the Bonifacio Monument in Caloocan, completing the Circumferential Road 4 system. Until the mid-1980s, many parts of the highway still overlooked vast grassland and open fields. By 1986, political opposition to the 20-year dictatorship of President Ferdinand Marcos mounted. In late February, high-ranking military officers including Defence Minister Juan Ponce Enrile and General Fidel Ramos, defected from the Marcos government and seized Camp Crame and Camp Aguinaldo, two military bases located across each other midway along EDSA. This triggered three days of peaceful demonstrations that became the People Power Revolution. The majority of protesters were gathered at the gates of the two bases, along a stretch of EDSA between the commercial districts of Cubao in Quezon City and Ortigas Center in Mandaluyong. Over two million Filipino civilians, along with political, military, and religious groups led by Archbishop of Manila Cardinal Jaime Sin, succeeded in toppling President Marcos. Corazon Aquino, the widow of assassinated opposition senator Benigno Aquino Jr., was installed as President on the morning of February 25; by midnight, Marcos had escaped Malacañang Palace with his family, and was flying to exile in Hawaii. Several landmarks commemorate historical events that occurred along the avenue. At the intersection of EDSA and Ortigas Avenue is EDSA Shrine, a Catholic church capped by a bronze statue of the Blessed Virgin Mary as Our Lady of Peace. The shrine is dedicated to this Marian title in memory of the pious folk belief that in the 1986 Revolution, the Virgin Mary personally shielded the protesters – many of whom were peacefully praying and singing – as they faced government troops, tanks, and aircraft. The People Power Monument (Tagalog: Monumento ng Lakás ng Bayan), consisting of a giant statue and esplanade, sits at the corner of EDSA and White Plains Avenue. Sculpted by Eduardo Castrillo and unveiled in 1993, the central sculpture depicts protesters standing upon a circular podium, all surrounding a woman (representing Ináng Bayan or the Motherland), reaching up to the heavens with her outstretched hands and broken shackles. A Philippine flag rises behind her, while a statue of Ninoy Aquino and an eternal flame stand on either side at its base. A huge, limestone-faced wall with grooves for ribbons in the national colours forms a backdrop to the scene. The surrounding pavement contains a row of flagstaffs, and is the center for protests and ceremonies held on the Revolution’s anniversary of February 25. EDSA-Roosevelt (Muñoz) in 2007, before the completion of the LRT-1 extension. After the People Power Revolution, the highway was commonly referred to as EDSA, and it was connected to its southern extensions. In 1997, construction began on the Manila Metro Rail Transit System, which runs the length of EDSA from North Avenue to Taft Avenue. It was opened under Joseph Estrada, the thirteenth President of the Philippines. The Second EDSA Revolution, which also took place along the avenue, resulted in the peaceful ouster of President Estrada following his impeachment trial. He was succeeded by his Vice-President, Gloria Macapagal-Arroyo. She was sworn in on the terrace of EDSA Shrine by then-Chief Justice Hilario Davide, Jr. at noon on January 20, 2001, several hours before Estrada and his family fled Malacañang Palace. In 2006, the avenue was further extended from Roxas Boulevard to the SM Mall of Asia, where it now ends at the Mall of Asia Globe and roundabout. That same year the avenue was badly damaged in September, when Typhoon Milenyo hit Manila. In 2010, the Manila LRT Line 1 (LRT-1) of the Manila Light Rail Transit System was extended from Monumento to Roosevelt, ultimately transversing EDSA to end at the site of the current North Avenue MRT Station. In August 2012, prior to the Congressional hearing of the controversial Reproductive Health Bill, the Catholic Church assembled a mass rally on EDSA to oppose the proposition. On February 25, 2015, thousands of people from various socio-civic, political and religious groups held a demonstration along EDSA, demanding that President Benigno Aquino III stand down. The protests were confined to an area near the Santolan intersection because of police prevented crowds from reaching the People Power Monument. On August 27–31 of the same year, Iglesia ni Cristo adherents staged demonstrations along EDSA near SM Megamall. They called on former Justice Secretary Leila De Lima to focus on issues such as the SAF 44 Incident instead of a case filed by a former INC minister against Church leaders. This, they claimed, was intervention that violated the constitutional provision separating church and state. On September 9, 2015, the Philippine National Police (PNP) deployed the Highway Patrol Group to support MMDA traffic constables easing traffic on congested segments of EDSA. Intersections are numbered by kilometre post, with Rizal Park in Manila designated as kilometre 0. N1 (MacArthur Highway) / N150 (Rizal Avenue Extension) Bonifacio Monument. Northern terminus. Continues west as Samson Road. 5th Street (B. Serrano) Westbound access via U-turn slot. 8th Street (A. De Jesus) Unsignaled intersection. Access to 5th Avenue. Biglang Awa Street Westbound access via U-turn slot. Access to 10th Avenue. N160 (Bonifacio Avenue) / E1 / AH26 (North Luzon Expressway) – Manila, Baguio Balintawak Cloverleaf. Kaingin Road, Howmart Road Eastbound/westbound access only. Access from opposite direction via U-turn slot. N129 (Congressional Avenue), Roosevelt Avenue Access from opposite directions via U-turn slot. Former traffic light intersection. Corregidor Street, Bansalangin Street Access from opposite directions via U-turn slot. N171 (West Avenue) / N173 (North Avenue) No access to North Avenue from southbound. Access to SM City North EDSA and TriNoma. Trinoma Access Road Northbound access only. Access to TriNoma. Vertis North Access Road Northbound access only. Access to Vertis North Complex. N170 (Quezon Avenue) – Manila, Quezon Memorial Circle Traffic light intersection. Panay Avenue Southbound access only. Mother Ignacia Avenue Southbound access only. Access to ABS-CBN Broadcasting Complex and St. Mary's College of Quezon City. Eugenio Lopez Drive Southbound access only. Access to ABS-CBN Broadcasting Complex. GMA Network Drive Southbound access only. Access to GMA Network Center. N172 (Timog Avenue) / N174 (East Avenue) Traffic light intersection. Access to GMA Network Center and Land Transportation Office head office. Kamias Road / Kamuning Road Traffic light intersection. No left turn from northbound. Ermin Garcia Street Northbound/southbound access only. Access from opposite directions via U-turn slots (northbound via Kamuning U-turn slot and southbound via Aurora Avenue U-turn slot. Access to Ramon Magsaysay High School from southbound. New York Street Northbound/southbound access only. Access from opposite direction via U-turn slots (northbound via Kamuning U-turn slot and southbound via Aurora Avenue U-turn slot. N180 / N59 (Aurora Boulevard) Traffic light intersection. Access to Araneta Center. Arayat Street / General Roxas Street Northbound/southbound access only. Access from opposite directions via U-turn slots (northbound via Aurora Boulevard U-turn slot and southbound via P. Tuazon U-turn slot. Access to Araneta Center from northbound. Mayor Ignacio Santos Diaz Street / General MacArthur Street Northbound/southbound access only. Access from opposite directions via U-turn slots (northbound via Aurora Boulevard U-turn slot and southbound via P. Tuazon U-turn slot. Access to Araneta Center from northbound. P. Tuazon Boulevard Traffic light intersection. Access to Araneta Center. N185 (Bonny Serrano Avenue), Santolan Road Traffic light intersection. Access to Camp Crame and Camp Aguinaldo. Annapolis Street Southbound access only. Connecticut Street Southbound access only. 13.458 White Plains Avenue Northbound access only. N60 (Ortigas Avenue) – Pasig Southbound ramp of EDSA–Ortigas Interchange. Access to Ortigas Center, Meralco Complex and The Medical City. N60 / N184 (Ortigas Avenue) – Pasig, San Juan Traffic light intersection under EDSA–Ortigas Interchange. Access to Robinsons Galleria and EDSA Shrine. N184 (Ortigas Avenue) – Greenhills, San Juan Northbound ramp of EDSA–Ortigas Interchange. Access to La Salle Greenhills and Greenhills Shopping Center. Guadix Drive Northbound access only. Access to Asian Development Bank. Julia Vargas Avenue Northbound access only. No right turn from Shaw Underpass. Access to SM Megamall. N141 (Shaw Boulevard) Traffic light intersection. Access to Shangri-la Plaza and Starmall EDSA-Shaw. Reliance Street Northbound access only. Access to TV5 Media Center and United Laboratories (Unilab) head office. Boni Avenue / Pioneer Street Northbound and southbound access only. 15.636 Guadalupe Bridge over Pasig River. Bernardino Street / P. Burgos Street Northbound and southbound access only. No access from opposite directions. Orense Street Northbound access only. Access to MMDA Metrobase. Estrella Street Exit from eastbound via flyover ramp. No northbound entrance. Access to Power Plant Mall. Connection with Estrella–Pantaleon Bridge. N190 (Kalayaan Avenue) – Bonifacio Global City Westbound access via U-turn slot. Access to EDSA westbound via flyover ramp. N190 (Gil Puyat Avenue) No northbound access. Ayala Avenue / McKinley Road Traffic light intersection. Access from Ayala Avenue either through flyover ramp or traffic light traffic light intersection. Access to Makati Central Business District, Glorietta, Forbes Park, Bonifacio Global City. Arnaiz Avenue / Pasay Road Extension Traffic light intersection. Access to Dasmariñas Village. Chino Roces Avenue Westbound exit and eastbound entrance. Connects with U-turn to EDSA eastbound, also route for vehicles which exceeds the height of the Chino Roces Avenue underpass. N145 / E2 / AH26 (South Luzon Expressway) – Manila, Alabang Magallanes Interchange. Access from eastbound via at-grade roads. A. Evangelista Street Eastbound access via U-turn slot under Magallanes Interchange. 19.784 Malibay Bridge over Malibay Creek. N171 (Aurora Boulevard) – NAIA Westbound ramp, and eastbound at-grade intersection. Access to EDSA westbound via U-turn slot under Magallanes Interchange. N170 (Taft Avenue) / Taft Avenue Extension Pasay Rotunda. No access to EDSA eastbound from Taft Avenue and no left turns (eastbound access and left turns provided by U-turn slot before F.B. Harrison Avenue. Access to Metropoint Mall. F.B. Harrison Avenue Access to opposite direction provided by U-turn slots. Diosdado Macapagal Boulevard Traffic light intersection. Jose Diokno Boulevard Roundabout. Western terminus. Serves SM Mall of Asia and surrounding areas. ^ The west section of the avenue from Roxas Boulevard towards SM Mall of Asia is unnumbered, since it is not an original part of the avenue. An overpass over the North Avenue-West Avenue Intersection and Mindanao Avenue Junction in the Triangle Park and a Flyover over Congressional Avenue and Roosevelt Avenue Intersection in Munoz are already approved, and may start construction in 2013. In 2011, Bohol Representative Rene Lopez Relampagos filed House Bill (HB) No. 5422, proposing to rename Epifanio de los Santos Avenue as "Corazon Aquino Avenue." The proposal is currently pending in the Philippine House of Representatives before the House Committee on Public Works and Highways. According to Relampagos, the idea to rename EDSA after Aquino (who led the 1986 People Power) was conceptualized in the aftermath of her death. On April 2, 2013, then President Noynoy Aquino gave the green light for the construction of a flyover at the perennially traffic-choked corner of Edsa and Taft Avenue in Metro Manila. The project is estimated to cost P2.8 billion, with the flyover extending to about 1.4 kilometers each side and it will take one and a half years to complete the project. After stricter implementation of bus lanes and barrier separation through plastic barriers, the Metropolitan Manila Development Authority (MMDA) will start to replace the orange barriers with a concrete permanent barrier used to separate the bus lanes from private vehicle lanes. With support from Singapore, the Metropolitan Manila Development Authority proposed the implementation of road pricing, based on the Electronic Road Pricing scheme on Singapore, on EDSA to alleviate traffic congestion, along with providing alternate routes and opening some gated community roads. Implementation is set for 2018, but Rene Santiago, a transport engineer and planner, criticized the proposal because it may only worsen congestion, along with the numerous intersections and side streets along EDSA. EDSA is featured in the film The Bourne Legacy. Portions of the road from Magallanes Interchange to Taft Avenue were featured in a car chase wherein Aaron Cross, played by Jeremy Renner, jumps from the Taft Avenue footbridge to a plying bus. Also, every February 25, the day of the EDSA People Power Revolution, the statues in the People Power Monument in the White Plains junction were repainted and yellow flags were placed on their hands, in order to commemorate the successful revolution. EDSA is also continuously being used in political campaigns by several politicians, particularly those who had been involved in the EDSA Revolution such as Joseph Estrada and Benigno Aquino III. The bridge connecting LRT-1's EDSA and MRT-3's Taft Avenue stations. The intersection of EDSA, West Avenue, and North Avenue in Quezon City. ^ a b c d Peter Uckung (February 22, 2012). "History in Asphalt (Epifanio de los Santos Avenue (Edsa) is the longest road in Metro Manila. Peter Uckung, senior researcher at the National Historical Commission of the Philippines (NHCP), explains how this thoroughfare came to be.)". Business world Online. Retrieved August 20, 2012. ^ Philippine Daily Inquirer (July 7, 2009). "Inquirer Headlines: EDSA". Philippine Daily Inquirer. Retrieved July 9, 2012. ^ a b Jao-Grey, Margarte (December 27, 2007). "Too Many Buses, Too Many Agencies Clog Edsa". Philippine Center for Investigative Journalism. Retrieved December 28, 2007. ^ a b Zarzuela, Maricar B. (January 12, 2016). "Private cars can't enter Edsa bus lanes starting Jan. 18". Inquirer.net. Philippine Daily Inquirer. Retrieved 29 January 2016. ^ ABS-CBN (August 3, 2012). "Church eyes red revolution vs RH Bill". Retrieved August 20, 2012. ^ "Thousands of people march along EDSA to call for the resignation of President Aquino on the 29th anniversary of the People Power Revolution". imgur. Retrieved February 25, 2015. ^ "FACE-OFF. Thousands of protesters face hundreds of cops blocking EDSA-Santolan". Retrieved February 25, 2015. ^ "Can the police fix EDSA traffic?". Rappler. Retrieved December 5, 2015. ^ "Metro Manila 3rd". 2016 DPWH Atlas. Department of Public Works and Highways. Retrieved May 21, 2017. ^ "Quezon City 1st". 2016 DPWH Atlas. Department of Public Works and Highways. Retrieved May 21, 2017. ^ "Quezon City 2nd". 2016 DPWH Atlas. Department of Public Works and Highways. Retrieved May 21, 2017. ^ "Metro Manila 1st". 2016 DPWH Atlas. Department of Public Works and Highways. Retrieved May 21, 2017. ^ "Metro Manila 2nd". 2016 DPWH Atlas. Department of Public Works and Highways. Retrieved May 21, 2017. ^ "South Manila". 2016 DPWH Atlas. Department of Public Works and Highways. Retrieved May 21, 2017. ^ "DPWH Future PP Projects" (PDF). Department of Public Works and Highways (Philippines). Retrieved December 15, 2012. ^ Brizuela, Maricar B. (January 26, 2016). "Edsa lane rule: 130 fined: barriers to be 'permanent'". Motioncars at Inquirer.net. Philippine Daily Inquirer. Retrieved 5 February 2016. Meanwhile, MMDA Traffic Engineering chief Neomie Recio also announced that the plastic barriers currently used to separate lanes would soon be replaced with more permanent, concrete separators to be provided by the DPWH. ^ "MMDA eyes congestion fee on EDSA to ease traffic". CNN Philippines. March 15, 2017. Retrieved March 22, 2017. ^ "'Bourne Legacy' shoot at EDSA-Taft then Palawan". Retrieved August 25, 2012. ^ GMA News Online (January 27, 2012). 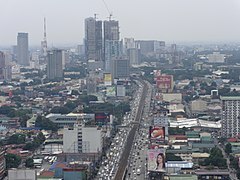 "'Bourne Legacy' to shoot on EDSA in Pasay, some roads closed". GMA News. Retrieved August 25, 2012.